Meticulously carved scrolled gilt decorated crown at crest over carved original antique glass front doors having true divided light gilt decorted panes in cartouche form outline. The overall lower chest in bombe form with carved gilded leaf detail having two short drawers over two long drawers mounted with cast bronze chinoiserie pagoda form escutcheons, raised on heavy scroll form feet. 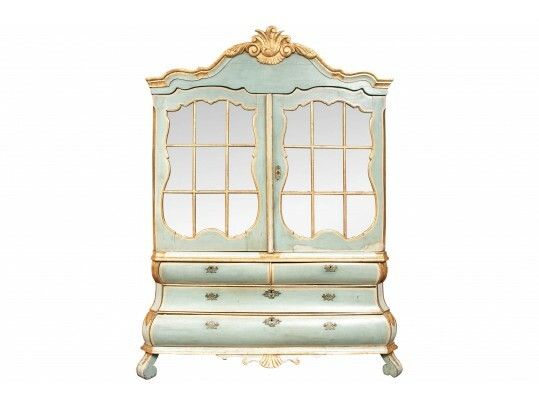 Allover paint decoration in deep aqua with gilt at every detail. Piece is in three parts and will need extensive packing for transportation. Two glass panes on left door have hairline cracks to upper right and lower left corner, age cracks to both sides and some expected wear commensurate with age and use..